So you want to cook the perfect sous vide steak? Let’s face it; cooking steaks has been largely responsible for the rapid interest in sous vide cooking. People know that cooking steak in the conventional way, using a skillet or a grill, can result in your steak being burned to a crisp or seriously under cooked. Sous vide cooking will gently cook your steak and there is no guesswork involved. Your steak will be cooked evenly from top to bottom, and the end result will be comparable to that offered by the very best restaurants. In a nutshell, sous vide provides you with precision cooking. If you desire a truly medium rare steak, then it is always difficult to judge the right time with conventional cooking. 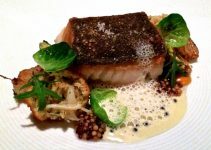 There is a really fine line with under or over cooking, and sous vide will eliminate this. When you use a sous vide machine for your steaks, there will be no need to watch over the steaks all of the time. You will not have to use a thermometer to poke the steak or cut into it while it is cooking. Once your steaks are in the water bath and the temperature and time has been set, you can walk away and do other things with your life, safe in the knowledge that your steaks will be perfectly cooked every time. If you use conventional cooking methods then you will probably end up with a steak that is perfectly cooked in the center, but will be overcooked at the edges. This does not happen with sous vide and your steak will be evenly cooked. All you have to do is prepare your steaks and then seal them with a vacuum sealer in a sous vide bag before cooking. Set the temperature to the right level and you are good to go. It is possible to cook any cut of steak perfectly with sous vide cooking. You can go for the expensive tender cuts such as porterhouse, rib eye and tenderloin or even the cheaper cuts such as skirt, flap or hanger. Choosing the right thickness of steak is important. If the steak is too thin you will not be able to achieve the perfect contrast between the interior and the exterior. Thin steaks can actually overcook before a nice crust has developed. A thicker steak is recommended for sous vide cooking, so that the interior is cooked perfectly. It is recommended to go for a steak at least an inch thick and more if possible. You can cook a large steak and this can be shared by two or more people. You will achieve better results doing this then by trying to cook 2 or 3 smaller steaks. When you cook a steak, the internal temperature of the cooking process will determine how well done it will turn out. As an example, if you do not let the cooking of a strip steak exceed 54°C (130°F) then it will never go beyond medium rare. This is where sous vide cooking comes into its own. If you cook a steak using conventional methods, you do not have this kind of temperature control, and a few seconds too long can result in an overcooked steak. With sous vide cooking it is a lot slower and more precise. You will be cooking for at least an hour. And the end of the sous vide cook cycle, you can be sure that your steak will be hot and properly cooked, and all you will need to do is sear it. If you like your steak rare then set the cooking temperature to 120°F (49°C). Bear in mind that the steak will be almost raw at the end of this cook, as most of the muscle proteins will not have contracted much. You should only really cook the tenderest cuts at this temperature, as lesser cuts will turn out particularly tough. For medium rare steaks you need to cook at 129°F (54°C). At this temperature the muscle proteins will be firming up, and there will be a bit of juice loss. You will be able to enjoy this red steak as it will have a cleaner bite, due to the muscle fibrils slipping past each other and mushing. This is a very popular choice when it comes to cooking steaks. A medium steak can be achieved at a temperature of 135°F (57°C). The steak will turn out to be a rosy pink color and very enjoyable. There will be quite a lot of juice loss, but the fat will be more rendered and softened to make up for this. You can get good results with coarse cuts such as skirt and hanger with medium cooking. At 145°F (63°C) you are looking at a medium to well done steak. Your steak will be a lot dryer as it will have lost a lot of juice. The steak will have a grainy, cottony like texture, and the medium to well done cook is best for hanger and skirt cuts, rather than the really tender cuts. Some people like their steaks well done. To be honest there is not a lot of point using sous vide cooking to achieve this as a grill will get the job done a lot quicker. If you want to go sous vide, then set the cooking temperature to over 156°F (69°C). How Long Should You Cook Your Sous Vide Steaks For? Some sous vide cooks will tell you that you can cook steak for days and it will not make any difference to the quality that you will achieve. This is not true, and the longer that you cook your steak, the less resistance there will be to your chewing it. The times that you need to cook for vary according to the type of meat that you are cooking. If you have a tenderloin cut then you should cook rare for 45 minutes up to 2.5 hours, medium rare from 45 minutes to 4 hours, medium from 45 minutes to 4 hours, medium to well done from 45 minutes to 3.5 hours and well done from 1 to 3 hours. For other cuts of meat cook rare for 1 to 2.5 hours, medium rare from 1 to 4 hours, medium from 1 to 4 hours, medium to well done for 1 to 3.5 hours and well done from 1 to 3 hours. The first thing to do is to heat your sous vide water bath to the correct temperature as advised previously. It will take a while for your water bath to reach the right temperature, and you need to wait for this before adding your steaks. The next thing to do is season your steaks. Use a generous helping of salt and pepper here, and make sure that you cover all areas of the steak. You can then add some aromatics such as rosemary sprigs or thyme into the sous vide bag. They should be evenly distributed. If you have a top rated vacuum sealer, then use this to seal the bag with the steak in it. You can use a zipper lock bag as an alternative, but you will need to ensure that all of the air is removed first. You can do this by displacement. Lower the bag into the water and the pressure will expel all of the air through the top. Once your steaks are prepared, and the water is at the right temperature, you can add them to the water bath to start cooking. Be sure to set the timer on the sous vide machine (or use an external timer if your machine doesn’t have one) in accordance with the instructions above. After the cooking time has elapsed you need to remove your steaks from the water bath and then open the bags. Take out the steaks and place them on paper towels. Dry them carefully by patting down each side. Any steak cooked sous vide will not have any browning on the surface, so it is a good idea to use your stove to finish the steak off. This will also improve the texture and flavor. 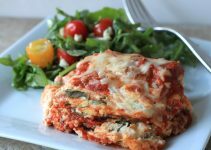 Use a skillet at the hottest temperature and add canola or vegetable oil. Preheat the skillet before searing the steaks. Put the steak into the skillet and add a little butter. This will help the steak to blacken and produce a dark crust a lot faster. You can add more aromatics here such as garlic cloves or sliced shallots. After 20-30 seconds you will need to turn the steak over and repeat the process. You can now use a torch if you want to. Do this while the steak is still cooking in the skillet. Use slow even strokes here and flip the steak and repeat. You want to end up with the surface being a pale brown color. Depending on how thick your cut is, is how long you will want to time out your steak cooking sous vide. The best steak sous vide recipes for beginners are quick and easy, and allow you to get familiar with how to cook steak in a way that isn’t as likely to burn up or grey out in a skillet. Rather, based on how thick you steak is, check to see how long you should let your steak sous vide cook. For .25″ to .5″ try between 23 and 30 minutes. For .5″ to 1″ try between 30 minutes to 1 hour. For 1.5″ to 2″ try 1 hour and 45 minutes to 3 hours. For 2″ to 2.5″ try 3 hours to 4 and half hours. For 3″ try just under 6 hours. 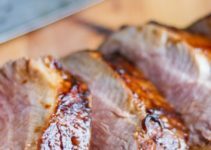 This might seem like a longer time to take to cook your steak, and you’re right – if you have a thick cut piece or square of steak – it will take longer to cook it sous vide certainly. However, skillet frying and grilling your steak, and especially the most valuable, juicy steaks, can leave you super disappointed if you accidentally over do it. Cooking steak sous vide pretty much eliminates that worry altogether. So take a step back, and think about what kind of side dishes you want to whip up with your steak sous vide entree and in a few hours, you’ll have a full circle happy belly. First, preheat up your sous vide bath to about 126 Fahrenheit for rare to medium-rare. Go higher, but no higher than 136 for medium-rare to well done steaks. Next, always season up your steaks directly. Some recommended seasonings and marinades are simple dry rubs or keeping it simple with pepper, salt, and rubbing in basic herbs and spice like thyme, garlic, cumin, onion, chili and turmeric. Third, time to seal up your steaks with the best sous vide vacuum sealer. You can use water displacement or you can vacuum seal in a BPA free plastic bag. Fourth up, let your steak cook sous vide. See above time recommendations for thickness. Five, remove your juicy, tenderized and fully cooked steaks from the bag and pat dry. Six, for a final touch of delicious, and a step many beginners don’t realize they still should do is put the steak on the the skillet or grille for a very quick and hot sear. Some ways to make things a little more fun or switch up how you cook your sous vide steak dishes, you can blowtorch your steak cuts when done for searing instead of grilling for an alternative crisp. You can let the water soak out of the steak for a few days before cooking, which is dry aging. Some of fun ways to spice up sous vide steak recipes is with extra actual spices. Don’t be afraid to try out different flavors and herbs, as the long soak of sous vide dishes bring out and pack a big punch with their slow cooking packages. If you follow the advice in this article, you will be able to enjoy steaks cooked to your preference perfectly every time. Sous vide cooking and skillet or grill searing is a perfect combination here. Enjoy your steak sous vide! 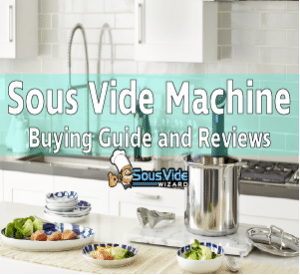 Be sure to also check out our sous vide machine buying guide and other sous vide product reviews. 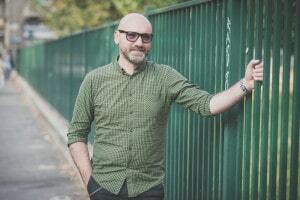 Joe Hughes, known by most as the Sous Vide Wizard, is an expert in the cooking technique known as sous vide. He runs the very popular website, SousVideWizard.com, which provides the latest sous vide industry news, techniques, tricks, and recipes. Hey, I'm Joe - also know as the Sous Vide Wizard. Welcome to my site. Let's go on a cooking journey together. Sous Vide Wizard Copyright © 2019.